Bisq.Network has added UNO to their decentralized trustless exchange! If you have never used Bisq (and I had not until yesterday) you will find its not like any other exchange you've encountered. Bisq requires you download a java app to connect to their network of traders. Once you work through the small learning curve, it's pretty easy to use. It just takes a little getting used to. Trades occur slower than on an exchange, not nearly as fast as a centralized exchange. Here's a screen shot of setting up a UNO trade. 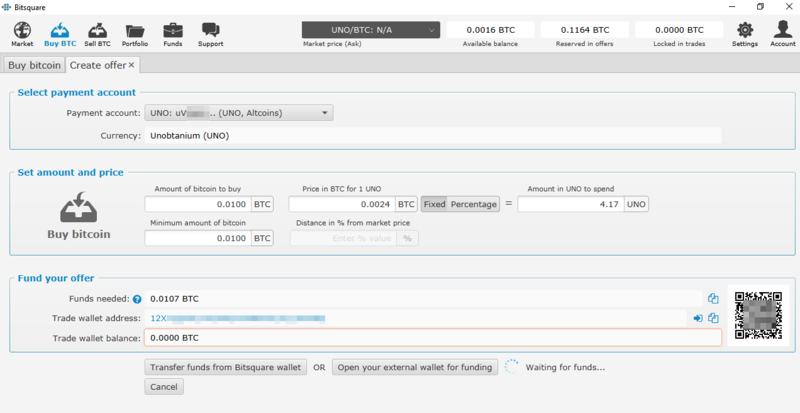 Before you can create a trade, you have to send Bitcoin to your Bisq wallet address. There is a deposit (in this case .01 btc) to guarantee the trade and prevent spam, but it is refunded after the transaction completes. Like I said, this is a different kind of exchange, a different paradigm for thinking about how trades can be accomplished without requiring trust. I'm glad UNO has this new arrow in it's quiver of tools. If Cryptsy/MintPal/MtGox and high profile exchange hacks have you concerned, or if you would just like to learn something different, go download the Bisq app and give it a try.